This entry was posted in Birds (鳥), Photography (写真) and tagged オオジュリン, birds, buntings, common reed bunting, Emberiza schoeniclus, 野鳥, winter birds, 冬鳥, 大寿林, 小鳥 by T Ibara Photo. Bookmark the permalink. Thank you 🙂 I’m glad you saw the little bird. Love the harmony of soft colors in your picture, Takami ❤ And the bunting is well camouflaged in the reeds, hopefully it will stay safe that way. Winter's Camp from P.S… Webisodes on Vimeo. This time of the year, we have lot of visitors from the much colder northern lands. I spotted some cranes last day in our neighborhood. I’m very happy this Common reed bunting has been receiving a postive response 🙂 As you see, it has very subdued colours in the winter, but I feel it adds to the beauty. I’m very glad you liked this little bird. I love the natural colours and how he blends in the reed field. But as you say, he does have his own distinct features! The bird’s camouflage is so perfect – you got a wonderful shot! Beautiful shot, Takami! This little female is in her element 🙂 Winter is the best time for the bird photography, I think. Absolutely amazing shot! Takami, you are the master of photography! Absolutely, Takami! Thank you, love looking at your photos, they are always super wonderful!! I hope you and your family is healthy and happy. I love the photo above, I love most of your photos. I want to thank you for visiting my art site yesterday. Sending good wishes for the weekend! Charming and so very touching, my friend. Just beautiful. I didn’t even see the bird at first! He or she is very well camouflaged. I completely understand – I had to blink twice to make sure this fellow was still there while frantically adjusting my camera settings 😀 You’re right, these birds (Common reed buntings) in their winter plumage blend in perfectly to their surroundings. Ahhh this is a photo that makes the viewer want to reach out and touch. The texture (almost the smell) comes through profoundly. And to see that little beauty tucked in there! Lovely! What a shot, Takami! Amazing you even saw this bird. Gorgeous!! It blends into the background so well, Takami. It would be easy to miss. 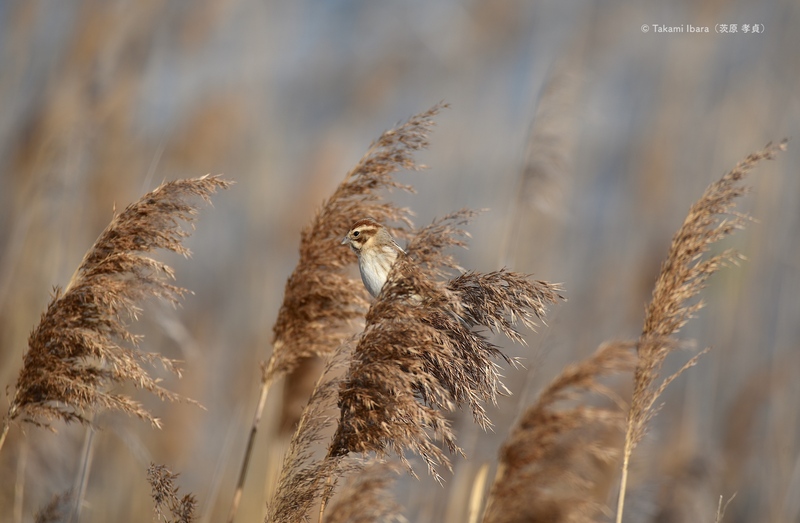 Yes, Tanja – common reed buntings perfectly blend in with the reeds. They are also quite fast too. Thank you for the ID, Takami. I had wondered.